An important application of Poisson models is to multilevel survival analysis via the connection with piecewise exponential models. I illustrate this approach with an analysis of infant and child mortality in Kenya using DHS data, with an abridged version in my encyclopedia article (Rodríguez, 2015) and full details in my chapter in the Handbook of Multilevel Analysis (Rodríguez, 2008). You’ll find the references with abstracts here. I fill focus now on the calculation of predicted probabilities after fitting the model. I start by storing the estimates of the fixed effects and computing the baseline cumulative hazard up to ages 1 and 5. I also store the first and third quartiles of the linear predictor and the estimated standard deviations of the community and family effects. Calculations are best done using Mata. 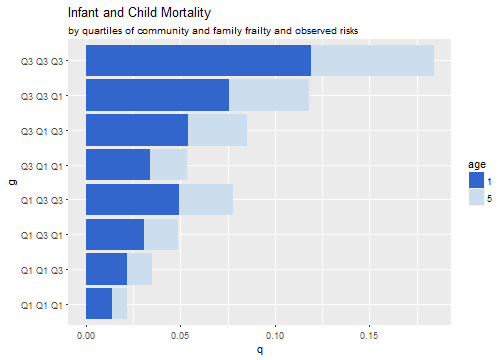 The conditional or subject-specific probabilities of dying by ages 1 and 5 at the first and third quartiles of observed and unobserved risks can be calculated as shown below. To simplify repetitive calculations I wrote a function that calculates these probabilities given the baseline hazard, the linear predictor, the z-scores for unobserved family and community frailty, and the two standard deviations. >                5 "Q1 Q3 Q3" 6 "Q1 Q3 Q1" 7 "Q1 Q1 Q3" 8 "Q1 Q1 Q1"
. gen q1 = .
. gen q5 = . To compute the marginal or population-average probabilities we need to integrate out the family and community effects using Gauss-Hermite quadrature. Here are the results for the first and third quartiles of observed risks. I use a function to do the integration and another to compute the integrand. 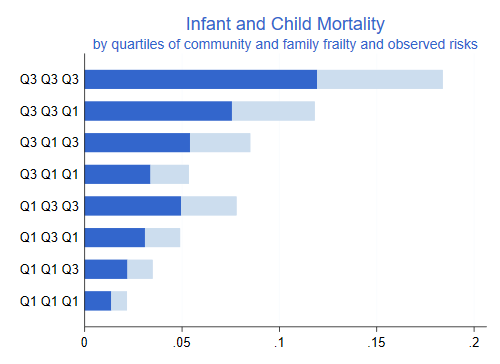 The average probability of infant and death for children with observed risks in Q1 and Q3 are 47 and 74 per thousand. The corresponding average probabilities of death by age 5 are 73 and 113 per thousand for Q1 and Q3. In both cases averaging is over all families and communities.